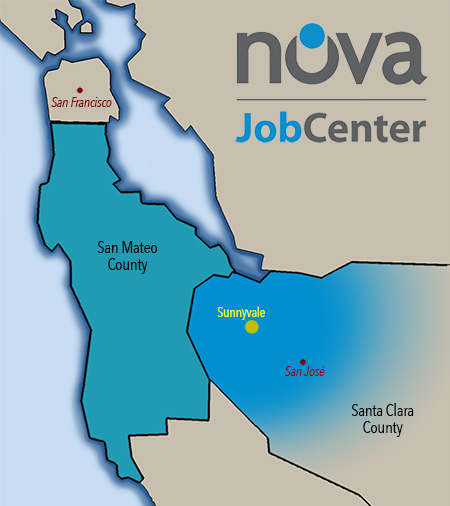 The NOVA Job Center works closely with local businesses to ensure that our programs provide opportunities that build the knowledge, skills, and attitudes necessary to address the workforce needs of Silicon Valley. For information on NOVA's services to business, click the purple sub-headings below to expand the content. When you need to grow your business, NOVA can help find quality candidates for your job openings. We can work to meet your staffing needs, directly or through our quality connections with relevant community organizations. Looking for Professional or Mid- to High-Skilled Candidates? Many NOVA job seekers are experienced in such fields as engineering, programming, project management, business administration, finance and accounting, human resources, and other technical and business operations professions. To let our talented pool of job seekers know about your openings, we invite you to post your jobs on NOVA's no-cost job board. NOVA also currently administers a program that funds tech-related internships. If you have technical opportunities but are not ready to hire, NOVA can help. Click to download the program flyer (PDF). Is your company recruiting skilled talent for a variety of job openings? Both the Sunnyvale and San Mateo job centers may be able to arrange on-site recruitment sessions through which you can meet with a number of vetted candidates. Contact NOVA's Business Services team for details. Looking for Entry-Level or Lesser-Skilled Candidates? Do you have entry-level positions or positions for which a youth might be appropriate? If so, we invite you to contact the NOVA Youth Office, which specializes in serving young workers, ages 16 to 24. NOVA hosts an online job board serving businesses throughout the San Francisco Bay Area. We invite you to add your job listings through the employer portal below. Running a business comes with considerable challenges. If you are considering laying off employees, closing a division, or shutting down business operations within California, we can help you ensure a smooth transition for your company and your employees, while ensuring compliance with legal requirements. NOVA will save you time and help you to understand all the options available to you. We can also help you provide your employees with outplacement service and retraining opportunities. The California Labor Code requires that employers give a 60-day notice to the affected employees and to both state and local representatives prior to a plant closing or mass layoff. If the closure or layoff will occur within San Mateo County or the Santa Clara County cities of Cupertino, Los Altos, Milpitas, Mountain View, Palo Alto, Santa Clara, or Sunnyvale, you must provide notice to NOVA, which is the local workforce development board for this region. Notification can be sent to NOVA's Business Services Team via the button below. When you need to upgrade your employees’ skills and provide them with professional development, NOVA can help you assess your training needs and connect with resources that suit your business. Programs such as California's Employment Training Panel can assist in funding specialized training for qualified workers through its program to provide funding to eligible companies to offset the cost of retraining your incumbent workers. NOVA's Communication Essentials class features practical techniques, interactive exercises, and immediately useful tools that focus on communication, facilitation, and collaboration. This three-day class will improve your employees' confidence and increase their effectiveness at the worksite. Contact NOVA's Business Services team to coordinate this onsite training. Values-Driven Work is a self-assessment tool for individuals to identify their unique patterns of values and understand how they are being met in their work activities and surroundings. While NOVA has discontinued the sale of the Values-Driven Work materials, we have inventory on hand that can be provided for just the cost of shipping. In addition, we are making the rights to VDW publicly available at no cost. For further information on ordering materials or accessing rights, please contact Rhonda Pryor at NOVA at 408-730-7232. Finding and hiring good employees with the right skill sets can be challenging. In many cases, candidates may have the right combination of enthusiasm and ability but lack specific skills you need for your business to thrive. NOVA’s On-the-Job Training (OJT) program helps your business invest in great candidate and transform them into productive and profitable employees. OJT is training conducted by an employer for an individual while he or she works and learns the skills necessary for productive and satisfactory job performance. With NOVA assistance, you may be eligible for wage reimbursement of up to 50% for the time it takes your new employee to learn the skills necessary for the job. Contact a NOVA business liaison today to learn more about our customized business solutions.